Stoney B has been in New Orleans for the last year, and he’s back playing in San Diego to the delight of local blues fans, including me. He is the real deal – a great blues man who plays the guitar and sings with a passion, grit, storytelling and talent you can never get enough of. He was playing with Lance Dieckmann’s band at the SpeakEasy the past couple of weeks, and that may be where you’ll find him for a while. Here he is performing Jimi Hendrix’ great cover song, Red House. The lighting at the SpeakEasy makes this video a bit grainy and out of focus, but it is worth viewing. I will get more videos of Stoney, and hopefully better quality. 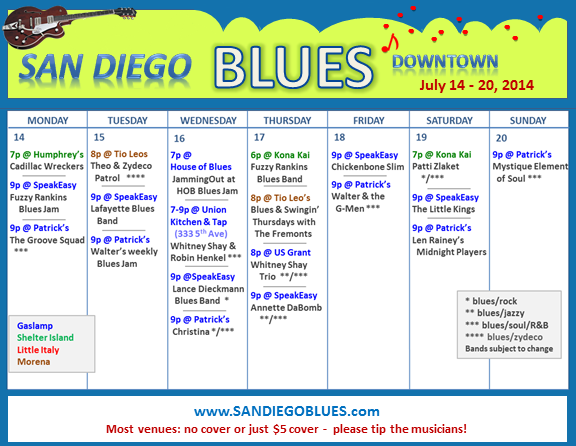 This week is a lot like last week – no San Diego blues at Kona Kai and not much blues at Patrick’s Gaslamp Pub. But it’s a good week at Humphrey’s Backstage and SpeakEasy (as usual). And the blues jams… well you never know, because you never know who might show up or who happens to be in town, and it can blow you away when it all lines up. I’m learning that Humphrey’s Backstage Lounge doesn’t tend to start on time and can be an hour off, so for now I’m going to list the times one hour later than they post on their website. Just a heads up. 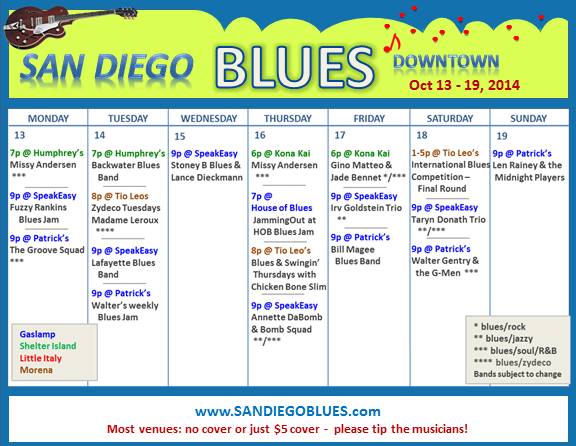 There is bit more blues this week than we’ve had downtown for a while, and one reason is the reopening of the Kona Kai lounge after their Spring renovations. Missy Andersen will be back there on Wednesday and Gino & Jade are also back!! 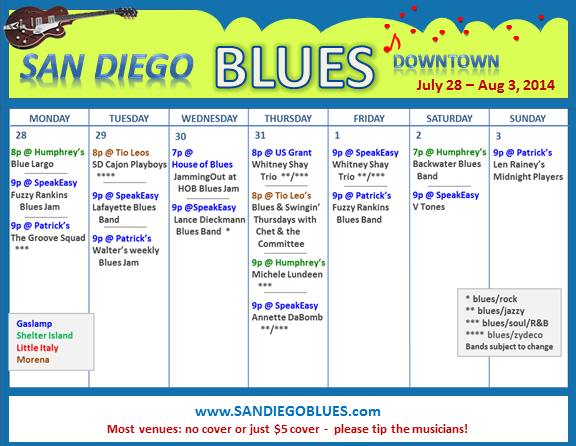 I’ve also added the Coronado Ferry Landing to the calendar, since they play blues there periodically on Sunday afternoons. 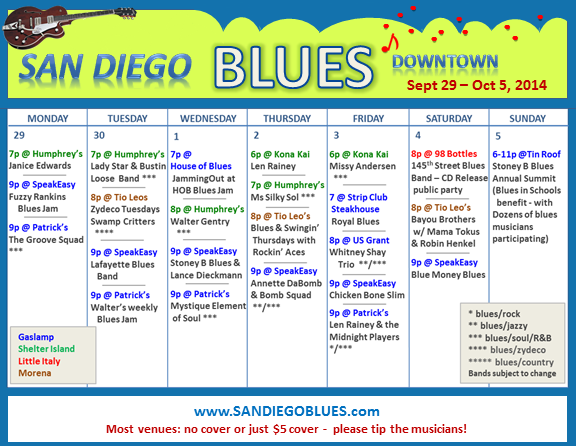 This week is Blue Frog Blues. 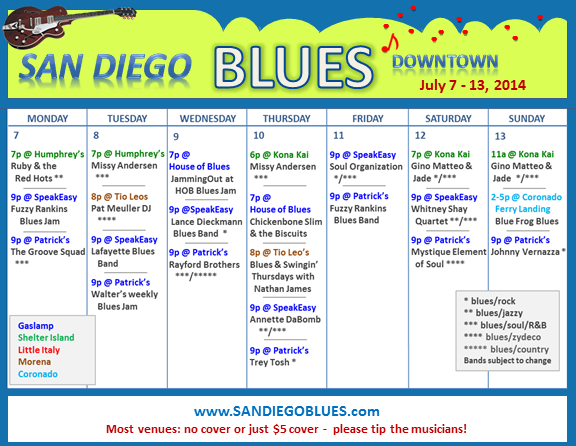 And of course we have the usual San Diego blues jams on Mondays (SpeakEasy), Tuesdays (Patrick’s) and Wednesdays at the House of Blues free stage. 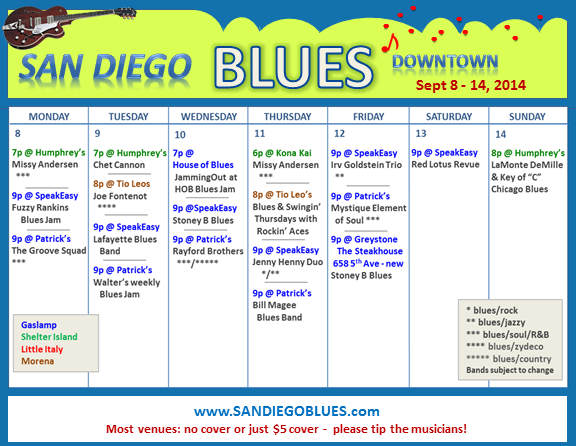 I’m also pleased that Patrick’s has mostly blues again this week, so it’s another great week of blues every single night. Patrick’s Pub almost always has blues on a Sunday night, and I went to hear some favorite locals: Len Rainey on bass and Johnny Vernazza on guitar, accompanied by Danny Martinez on drums. These guys are all regulars at Patrick’s, and I always enjoy hearing them play. Here’s Len singing cover song Kiddio. Patrick’s is always dark, so it’s hard to get good crisp video. I lightened it up, and it’s still grainy. But you can see and hear them fairly well. And here they are performing cover song Born Under a Bad Sign.